Geb was believed to be the deity of earth, and was central to the ancient Egyptian creation myth. In fact, the ancient Egyptians referred to Earth as the “House of Geb.” According to the ancient Egyptians, Geb was the grandson of Ra, and the son of Shu and Tefnut, the deities of air and moisture, respectively. Additionally, Geb was the twin of Nut, the goddess of the sky. It was believed that Geb and Nut were born gripped tightly in each other’s arms, and had to be separated by their father Shu (air). To the ancient Egyptians, this explained why earth and sky were separated from one another by the air we breathe. Geb was frequently portrayed as the father of snakes, and was often depicted as such, or as a man with the head of a snake. Additionally, because the hieroglyph for the name Geb was a goose, the deity was often assigned the head of a goose when depicted. 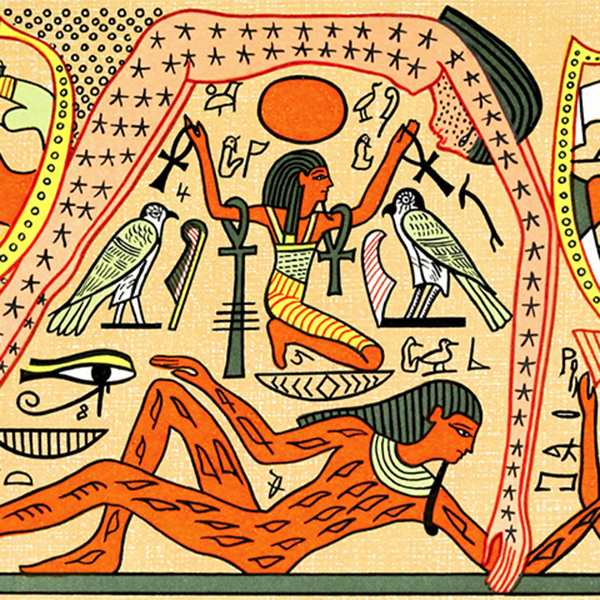 Image: An illustration of the deities Geb (lying on the ground) and Nut (arching over Geb), taken from the book The Gods of the Egyptians Vol. II, by E. A. Wallis Budge.